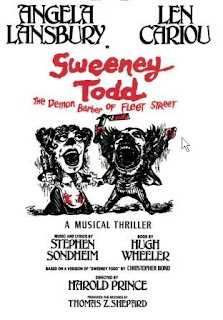 I'm slowly but surely meeting all of the original cast members of Sweeney Todd. Winter nights seem to be best for such an endeavor. Tonight, February 9, 2009, I met Ken Jennings! He was the original Tobias. On February 4, 2008, I met Sweeney himself, Len Cariou. On February 11, 2007, I met Victor Garber, the original Anthony. On February 21, 2006, I met Sarah Rice. She was the original Johanna. On January 26, 2006, I met Angela Lansbury, the original Mrs. Lovett, for the first time. That just leaves four characters. I guess I need to wander over to the Billy Elliot stage door to meet the original Beggar Woman, Merle Louise. Anybody know where I can find Edmund Lyndeck (Judge Turpin), Joaquin Romaguera (Pirelli) and Jack Eric Williams (the Beadle)? Wow, what an awesome project! I hope you find the other three. An admirable ambition. But I'm afraid you're going to need a medium to meet Jack Eric Williams. He passed away. There's a song about him, including his memorial service, in the William Finn song cycle Elegies. Good luck with the rest of the cast. Esther, this isn't a project - it's just occurred to me that it has sort of happened. Chris, thanks for the info about Jack Eric. I love recording of Eligies and never put two and two together that it was about him. Thank you!